V-215, Leichte Flieger Staffel 2, 25th Anniversary, Freitag 1990. Matt olive green with large yellow panels on the fuselage sides and yellow stripes along the tail and on the fins. V-223, Swiss Army Air Corps A.M.E.F, Emmen 1996. Mostly dayglo red/orange with some matt olive green. This is a 'Rьebli' (= carrot) used as a target for training Hunter pilots in the art of helicopter-hunting. Rumour says that the dayglo had to be applied so that they could find their prey ! V-229, Leichte Transport Staffel 4, 30th Anniversary, Grьningen 1994. Gloss blue with a lot of red anniversary artwork. Also included on the sheet are three Royal Navy Buccaneers, and five French Air Force Grumman F8F-1 Bearcats from their campaigns in Indochina. #72-034 French H-21's and Royal Navy Lynxes. H-21, ALAT GH.2, serial AG, Constantine 1956. Natural metal with yellow stripes on the fins. H-21, ALAT GH.2, serial AAN, Oran-la-Sйnia 1962. Dark matt green. H-21, Aйronautique Navale 31F, serial 31F-8, Alger Maison-Blanche 1958. Dark midnight blue. A particularly large amount of stencilling is provided for these three aircraft. Lynx HAS.3, XZ246/ED/434, HMS Endurance / 829NAS, Portland 1988. Dark sea grey with signal red nose and doors. (cf. picture hkn #85). Lynx HAS.8, XZ238/ED/434, HMS Endurance / 815NAS, Portland 1993. Medium sea grey with red nose, doors, and trailing edge of fin, plus Union flag and Penguins. Also included on the sheet are a Swiss Air Force Hawk trainer and a pair of French Air Force Jodel D.140 trainers. XV539/N/68, Royal Navy 814NAS, HMS Invincible 1995. This is not the spectacular tiger-striped Sea King that I had hoped for (see picture in hkn #70), but a rather more restrained scheme with yellow (paint) and black (decal) stripes and claws on the sponsons and a smallish tiger's face on the nose. Also included on the sheet are two gloss black Royal Navy Hawk T.1A's, and five French Air Force Douglas Skyraiders from campaigns in Algeria, Chad & Madagascar. #72-036 Royal Navy Westland Wasp HAS.1's. XS527, HMS Endurance / 829NAS, South Georgia 1982. RAF blue-grey and light Admiralty grey camoflage. This one carried AS.12 missiles and damaged the Argentine Navy submarine Santa Fй in May 1982. XS537/0, Admiral's Barge, HMS Bulwark / 845NAS 1982. Bright green, with torpedos. XT415 or XT446, Fishery Protection, HMS Rhyl / 829NAS c.1978. RAF blue-grey. XT778/430, HMS Achilles / 829NAS 1988. RAF blue-grey with yellow primer 'wasp' tail stripes. XT794, HMS Herald / 829NAS, Falklands 1982. RAF blue-grey with white sides & nose, and with Red Cross ambulance markings. XT795/373, St.Helena Flight 829NAS, Falklands 1982. RAF blue-grey with Exocet decoy and AS.12 missiles. Also included on the sheet are four French Air Force Dassault Mystere IVA's, 1956-59. 2. A recent book from Wings And Wheels, Present Aircraft Line No.3 "Czech Tigers in Detail" with 80 pages in all, includes 12 pages of pictures of the Mi-2, Mi-8, Mi-17, Mi-24D and Mi-24V. 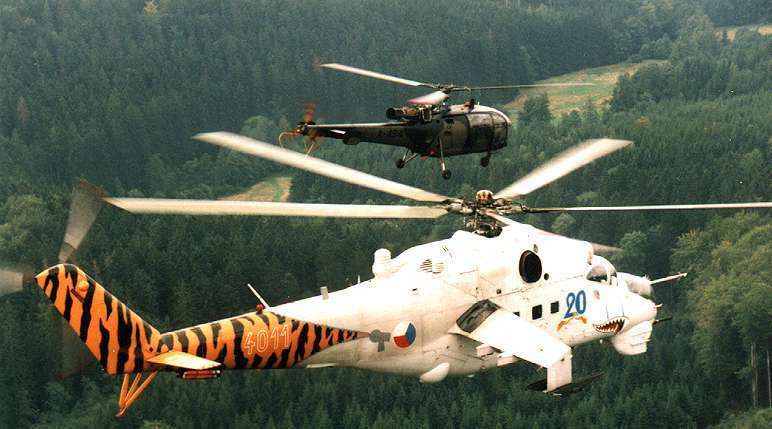 The liveries shown are special markings like the tiger-striped Mi-24, and also current camouflage. If you love gaudy schemes such as tigers and sharks, this book is recommended. 3. It looks as though due to time and work constraints Rotorcraft will not have their Oryx, Rooivalk and Bk-117's ready for sale at Telford in October. What they will have on display are the masters plus some photos of two new exciting Oryx variants. This is going to be a disappointment to some modellers but they don't want to cut corners and rush things, so they will display the models and take orders.